On a quiet street in Langley BC the unthinkable happens in the early morning yesterday and twice again today. A truckload of men drive up to a "family" owned cattle farm. You know the ones...the animals are sold for meat. They pick their victim, their dinner for the next few months. It's brought to the SLAUGHTER BARN. Chains are put around it's back two legs, the chain is hoisted up over the rafters, yes with the fully conscious cow attached. The cow hangs there swinging , terrified, in agony, her throat is cut, then her belly is sliced open to gut her. She was not stunned, or shot or unconscious when this happened. She felt pain and terror. This did happen just yesterday and again today. It makes me sick, it's all I can think about since I heard last night, I see it in my head over and over again. 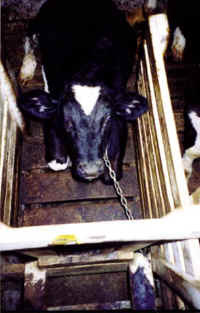 Calves are chained on two foot chains 24/7. They are only fed milk. They are weak and anaemic, this makes their flesh light in colour, they are basically sick. People like to eat white meat. They aren't allowed to move around, movement causes muscle and muscle is tough. People like to eat tender meat. Sickening and disgusting is what it is.